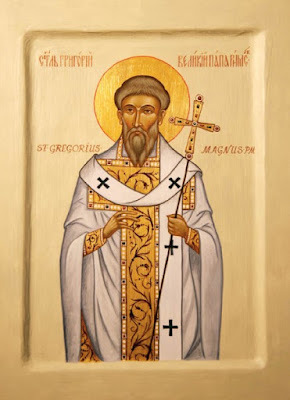 Having witnessed the endless string of disasters that shattered his beloved Italy in the late 6th century AD, Pope Saint Gregory the Great set down in the Dialogues a sequence of tales to help his contemporaries escape from their worldly troubles and contemplate eternal life. The Dialogues are in the form of a dialogue with his deacon Peter. The following is taken from Book 4, where a dialogue takes place on the subject of hell and eternal torment. PETER. I understand very well what you say, but by this reason I am driven into such straights, that I must stand in fear both of those sins which I know, and also of those which I know not. But because a little before you discoursed of the places of torments: in what part of the world, I beseech you, are we to believe that hell is, whether above the earth or beneath the same? GREGORY. Touching this point I dare not rashly define anything: for some have been of opinion that hell was in some place upon the earth; and others think that it is under the earth, but then this doubt arises, for if it be therefore called hell, or an infernal place, because it is below, then as the earth is distant from heaven, so likewise should hell be distant from the earth, for which cause, perhaps, the Prophet says: "Thou hast delivered my soul from the lower hell;" so that the higher hell may seem to be upon the earth, and the lower under the earth. And with this opinion that sentence of John agrees, who, when he had said that he saw a book sealed with seven seals, and that none was found worthy, neither in heaven, nor in earth, nor under the earth, to open the book, and loose the seals thereof, he added forthwith: "And I wept much," which book, notwithstanding, afterward he said was opened by a lion of the tribe of Judah. By which book, what else can be meant but Holy Scripture, which our Savior alone did open: for being made man, by his death, resurrection, and ascension, he did reveal and make manifest all those mysteries which in that book were closed and shut up. And none in heaven, because not any Angel; none upon earth, because not any man living in body; not any under the earth was found worthy. Because neither the souls departed from their bodies could open unto us, beside our Lord himself, the secrets of that sacred book. Seeing, then, none under the earth is said to be found worthy to open that book, I see not anything else, but that we should believe that hell is in the lower parts under the earth. PETER. I beseech you: Is there one fire in hell, or, according to the diversity of sinners, be there so many sorts of fire prepared in that place? GREGORY. The fire of hell is but one, yet does it not in one manner torment all sinners. For everyone there, according to the quantity of his sin, has the measure of his pain. For as in this world, many live under one and the same sun, and yet do not alike feel the heat thereof: for some be burnt more, and some less, so in that one fire, diverse manners of burning be found. So that although the fire be there all alike, yet does it not in one manner and alike burn and torment them that be damned. GREGORY. Certain it is, and without all doubt most true, that as the good shall have no end of their joys, so the wicked never any release of their torments. For our Savior himself said: "The wicked shall go into everlasting punishment, and the just into everlasting life." Seeing, then, it is true, that which he had promised to his friends, it cannot be false that which he had threatened to his enemies. PETER. What if it be said that he did threaten eternal pain to wicked lives, that he might thereby restrain them from committing of sins? GREGORY. If that which he did threaten be false, because his intent was by that means to keep men from wicked life, then likewise must we say that those things are false which he did promise, and that his mind was thereby to provoke us to virtue. But what man, though mad, dare presume so to say? For if he threatened that which he meant not to put into execution, while we are desirous to make him merciful, we are forced likewise (which is horrible to speak) to affirm him to be deceitful. PETER. I am wanting to know how sin can justly be punished without end, which had an end when it was committed. GREGORY. This which you say might have some reason, if the just judge did only consider the sins committed, and not the minds with which they were committed. For the reason why wicked men made an end of sinning was, because they also made an end of their life. For willingly they would, had it been in their power, have lived without end, that they might in like manner have sinned without end. For they do plainly declare that they desired always to live in sin, who never, so long as they were in this world, gave over their wicked life. Therefore it belongs to the great justice of the supreme judge, that they should never want torments and punishment in the next world, who in this would never give over their wicked and sinful life. PETER. But no judge that loves justice takes pleasure in cruelty, and the reason why the just master commands his wicked servant to be punished is, that he may give over his lewd life. If, then, the wicked that are tormented in hell fire never come to amend themselves, to what end shall they always burn in those flames? GREGORY. Almighty God, because he is merciful and full of pity, takes no pleasure in the torments of wretched men, but because he is also just, therefore doth he never give over to punish the wicked. All which being condemned to perpetual pains, punished they are for their own wickedness. And yet shall they always there burn in fire for some end, and that is, that all those which be just and God's servants may in God behold the joys which they possess, and in them see the torments which they have escaped, to the end that they may thereby always acknowledge themselves grateful to God for his grace, in that they perceive through his divine assistance, what sins they have overcome, which they behold in others to be punished everlastingly. PETER. And how, I pray you, can they be holy and saints, if they pray not for their enemies, whom they see to lie in such torments, when it is said to them: "Pray for your enemies"? GREGORY. They pray for their enemies at such time as their hearts may be turned to fruitful penance, and so be saved> For what purpose else do we pray for our enemies, but, as the Apostle says, that God may give them repentance to know the truth, and recover themselves from the devil, of whom they are held captive at his will? PETER. I like very well your saying: for how shall they pray for them, who by no means can be converted from their wickedness, and brought to do the works of justice? GREGORY. You see, then, that the reason is all one, why, in the next life, none shall pray for men condemned forever to hell fire. That there is now no praying for the devil and his angels, sentenced to everlasting torments, this also is the very reason why holy men do not now pray for them that die in their infidelity and known wicked life, for seeing certain it is that they be condemned to endless pains, to what purpose should they pray for them, when they know that no petition will be admitted of God, their just judge? And therefore, if now holy men living upon earth take no compassion of those that be dead and damned for their sins, when as yet they know that themselves do some thing through the frailty of the flesh, which is also to be judged, how much more straightly and severely do they behold the torments of the damned, when they be themselves delivered from all vice of corruption, and be more nearly united to true justice itself. For the force of justice so possesses their souls, in that they be so intrinsical with the most just judge, that they list not by any means to do that which they know is not conformable to his divine pleasure.